George Graham Reviews Josh Ritter's "Hello Starling"
It is a long-running phenomenon in music, and indeed in much of the arts that one has to go away from home to be appreciated. Music fans seem more likely to go out to see a performer from someplace far away than from their own backyard, even though the homegrown talent may be superior. Audiences in Pennsylvania might be more tempted to attend a performance by a band from, say Idaho, than from the Keystone state, and vice versa . So it's not surprising that a number of artists have established careers in faraway places, including other continents, after being mostly ignored at home. A good example of this is one of the veterans of our Homegrown Music series, Neal Casal, who found a receptive audience for his articulate roots-rock in Europe while mainly finding work as a sideman here in the US. And Europe has been a fertile ground for a number of good American singer-songwriters who find almost no interest from the American record business. This week, we have another example of a worthy singer-songwriter who happens to be originally from Idaho and who is finding considerable success in Ireland. He is Josh Ritter, and his new CD is called Hello Starling. Born in Moscow, Idaho in 1976, to two neuroscientists, according to his biography, he bought his first guitar at a K-Mart after hearing classic folk from Bob Dylan and Johnny Cash. He graduated from Oberlin College in Ohio originally with the intent of following in his parents' scientific footsteps, but found himself increasingly drawn to the music of artists like Leonard Cohen, the late Townes Van Zandt, and neo-traditionalist Gillian Welch. So Ritter moved to the Boston area, with its active folk scene, and worked to put together a debut album in 2001, called The Golden Age of Radio recorded on a shoestring budget. Like many on the folk circuit, Ritter sold his CDs mainly "on the gig," to audiences at the folk clubs where he played. One copy got to the hands of the head of Signature Sounds Records, which released the CD nationally in the beginning of 2002. At one appearance in Boston last year, Ritter shared the stage with Glen Hansard of the Irish band the Frames, who invited Ritter to come to Ireland and open a series of shows for the Frames. Ritter's career quickly took off, with one of his songs achieving top 40 status in Ireland, followed by sold-out tours, and even a band appearing in Cork specializing in covers of his songs. He has also attracted the attention of the folk community in his home country, with Joan Baez also covering one of Ritter's songs on her newest CD. Ritter has also toured and performed with Liz Phair and Beth Orton, as well as Ms. Baez. And Ritter got some unlikely exposure when his music was used in an episode of the hit cable TV series "6 Feet Under." For his second album, Ritter worked with Irish producer David Odlum and recorded at a studio in rural France with his regular touring band. He created a fine new album that captures his thoughtful love songs in a relaxed, laid-back, rootsy, and vaguely retro style that recalls Ritter's heroes, including Dylan and Cohen, along with hints of Nick Drake. There is plenty of the plaintive B-3 organ that evoking Al Kooper's work with Dylan on Blonde on Blonde, but also the slow acoustic guitar arrangements that hint at Cohen's early work. Ritter's band includes Sam Kassirer on the keyboards, bassist Zack Hickman, who also plays some pedal steel guitar, drummer Dave Hingerty, and producer Odlum who plays guitar and mandolin. Ritter plays some violin, in addition to his folkie-style acoustic guitar. 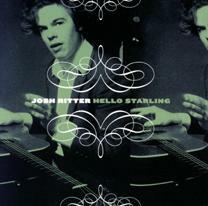 Josh Ritter's new second CD Hello Starling does everything that a good singer-songwriter album should do -- provide well-crafted lyrics, with a pleasing, mostly acoustic delivery, and appealingly honest vocals that have already made Ritter a star in Ireland, and attracted influential fans here in the US. The CD has a wonderfully relaxed sound with one foot in the history of the singer-songwriter genre occasionally drawing inspiration from the 1960s recordings of Bob Dylan and Leonard Cohen. Understatement is the byword of the production, as well as of Ritter's own songs. Our grade for sound quality is an unqualified "A." The recording, made in an old farmhouse in France on vintage equipment once owned by Curtis Mayfield, is as understated as the music, clean and unfettered by effects, and remarkably free from the scourge of heavy volume compression which anymore seems mandatory on pop CDs. The sound of Hello Starling is open and airy, and you can turn up the volume and enjoy the pleasing ebb and flow of the music. Ireland has discovered the music of Josh Ritter, now it remains to be seen he can be as appreciated in his home country. (c) Copyright 2003 George D. Graham. All rights reseved.